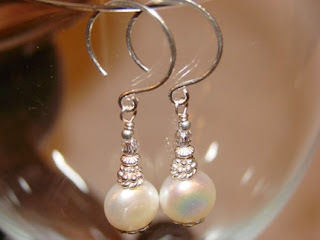 MiShel Designs: More Designers Using My Earring Wires - Woo Hoo! 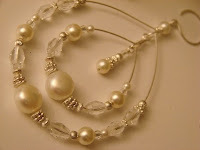 More Designers Using My Earring Wires - Woo Hoo! I've asked some of my customers to send me pics of the designs they create using my earring wires that they've ordered from my Etsy Shop - Shel's Jewelry Supplies - and I've gotten some great submissions! Today I'd like to feature Teresa Original Designs from Etsy. Her designs are very nice and I like her Bridial Designs best as they range from soft and romantic to elgantly bold and stylish - way cool if you ask me!! Here's just a couple that are on her site now. I imagine a bride wearing these with a low cut, scoop neck dress with little crystals around the necklice and shoulders - scrumptious, don't you agree? With all the Fall and Winter weddings around the corner and of course, the winter gift giving season that's almost upon us, there's lots of Etsy shops for you to browse through and I'm sure you'll find many treasures that fit your style to a "T"! Peace, Love and Gorgeous Earrings Baby! !